Food and cooking is a big thing to me. I've worked food industry, owned a restaurant, worked as a consultant to coffee firms and the like. The galley on Floating Empire was NOT going to be a two burner propane stove and an ice chest....okay maybe the ice chest. Instead....being re enactors....we're building an 18 century hearth kitchen. If you'd like some great info on this, check out some of the youtube videos of Jas Townsend and Son. We got a lot of ideas from that wonderful company. When we started buying stuff for the boat, we purchased a sink that was wwwAAAAAAAyyyy too large for the counter space we had. It took us a bit to realize that. Our main galley counter is 6' by 20", so most landlocked kitchen sinks are too wide. 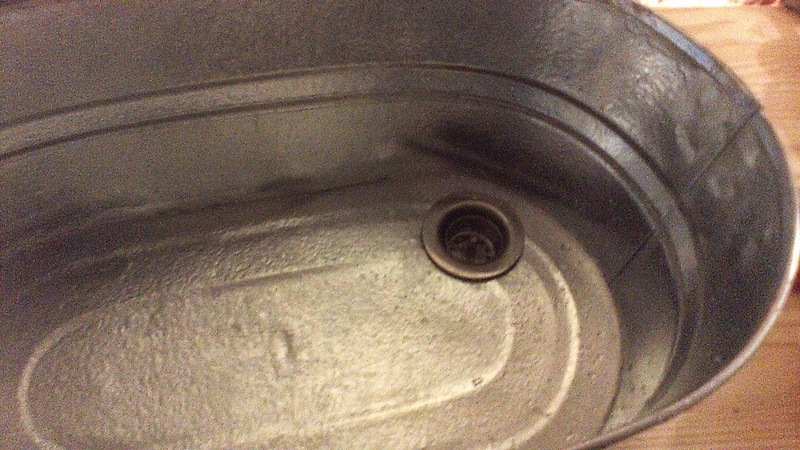 We looked at RV sinks (which would work) and using, as do many catering trailers, a 20" steam pan as a sink, but while wandering through the hardware store I came across these great galvanized oval tubs from Behrens. They're a tad over 12" wide by 20" long and a full 8" deep. Beside we loved the look. So I grabbed at couple (about $15 apiece). Our Galley concept, given cooking styles, was to make ALL the counters cutting board. 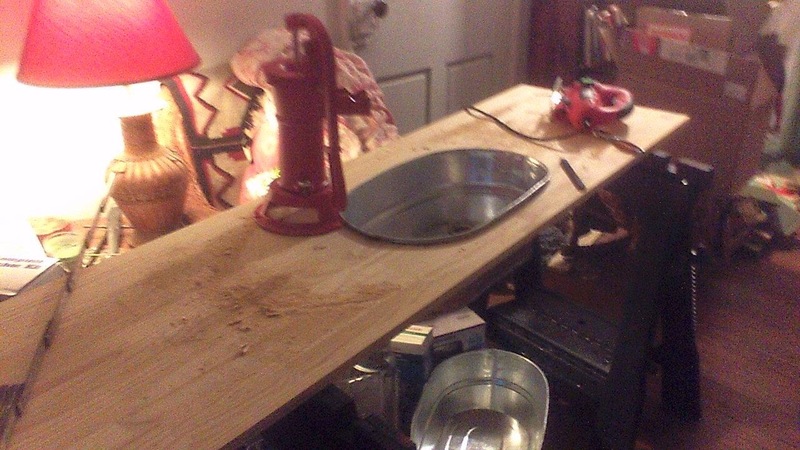 Everything is a prep surface, using premade glued pine panels for most. Sanded and oiled, they make great cutting surfaces. So we started by cutting a hole in the tub for a bar sink drain. The drain is offset so the pipes can allow more storage room below. The GRAIN is because its kinda dark in here. Please note, this is one freaking LOUD process. 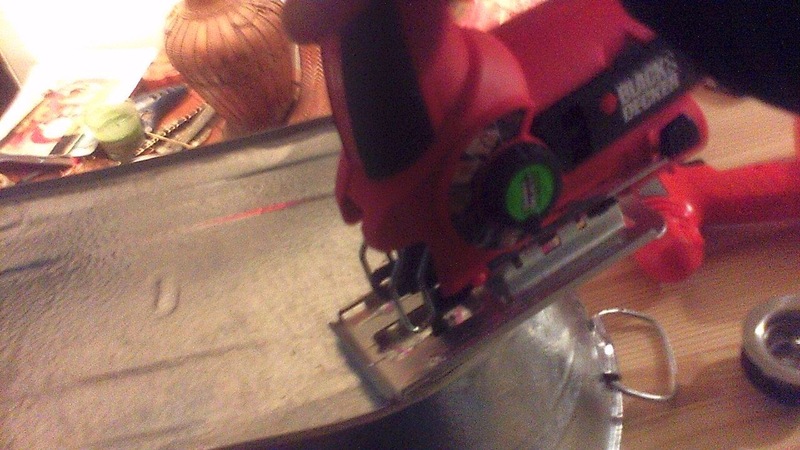 The whole tub is a sounding drum, and it's really easy to get off your line with a jigsaw. My phone went off three times while I was making this cut. Didn't hear a thing........not then and not for the next 17 minutes.....note to self: Ear Plugs. 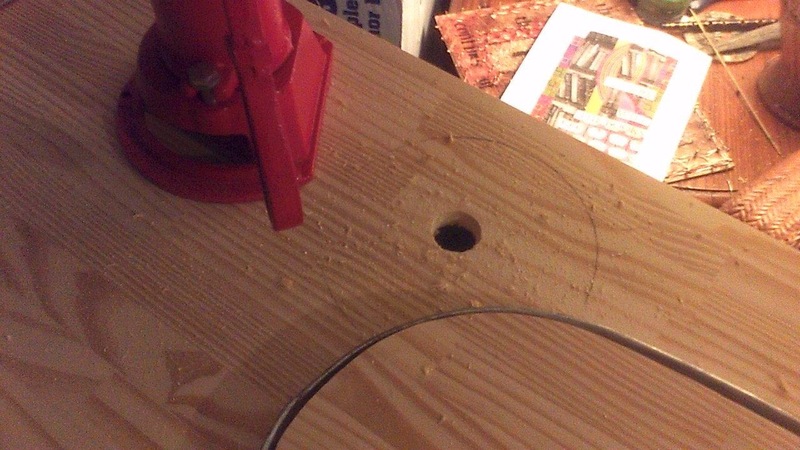 I traced around the inverted tub on the countertop and cut a line about 1/4" inside that so that it would drop through and rest just below the lip. Please be aware, these things flex, and you'll probably have to cut off or pound flat the handles to make them fit. I kept the cut out piece to make a cover for the sink. Here you can see the cut out in place in the insset tub while I drill the 1 1/4" hole for the galley pitcher pump. 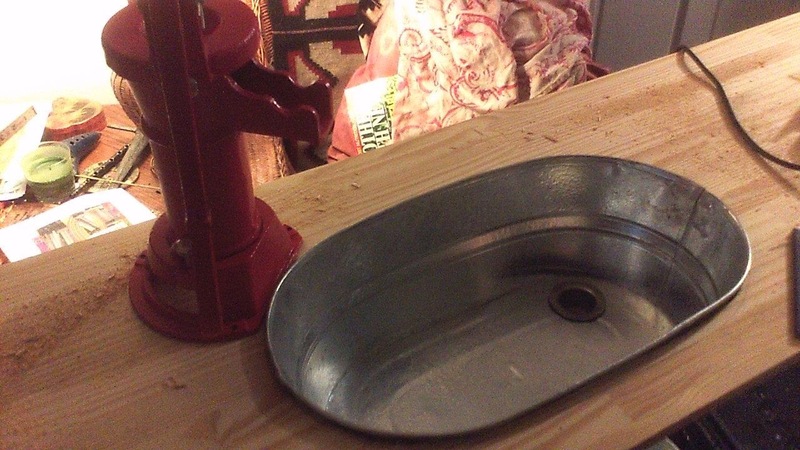 And here's the rough sink and pump in place, sans caulking, oil, sanding...and, well, boat. Heres a long shot to give you an idea of the size. Sorry about the quality...not much light in here. So tomorrow I'll sand, bevel the edges a bit, oil the wood, and begin caulking stuff in place. Progress, even though indoors. Exciting, no?